I’m not exactly sure why, but when it comes to holiday sweets, my mind automatically goes to cookies. I’m reminded of times when Mom would bake sugar cookies and we’d sit around the oak kitchen table and decorate cookies for hours. Painting was easier for little hands rather than a piping bag, so she’d equip me with a paintbrush and a special thin icing she’d make that resembled the consistency of acrylic paint and I’d paint away. Memories like that are what the holidays are all about. To this day, we all get together right before Christmas to do our holiday baking and candy making as a family. It’s a tradition that we’re proud to keep alive. That said, spending time with your family in the kitchen does have look the same as us. With our time being in short supply during this time of year, sometimes 30 minutes is all you can manage. And that’s perfectly fine. It’s about the memories you make, not about the amount of time you spend together. And if that’s the case, I’ve got the perfect recipe for you. 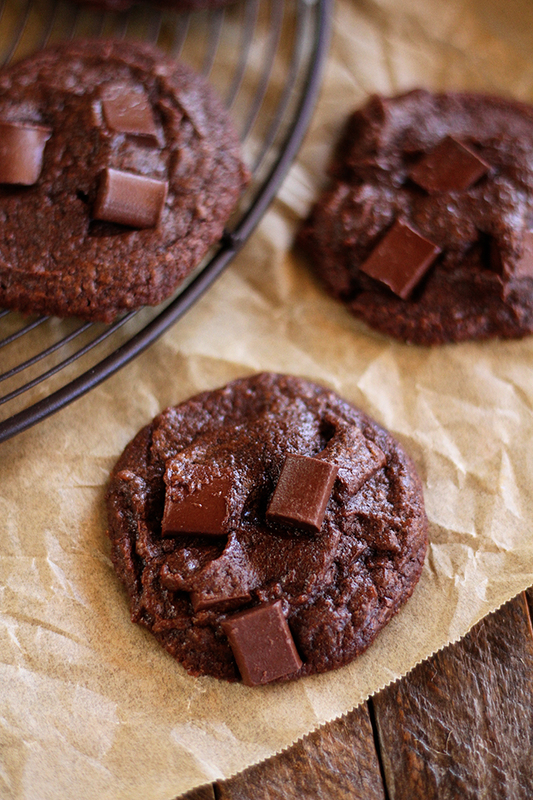 These Fudgy Brownie Cookies have all the gooey, chocolatey flavor of decadent brownies but in a fun little cookie. They’re easy, delicious, and are the perfect thing to whip up when you only have a few minutes in the kitchen. 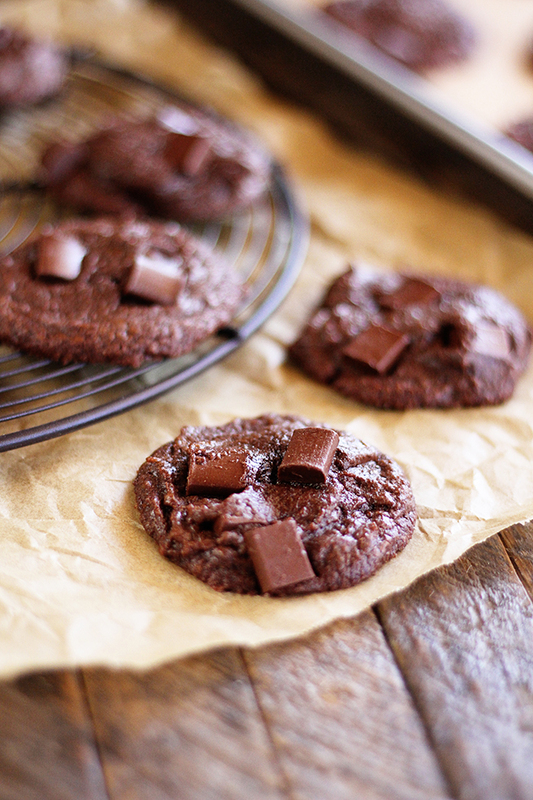 And the decadence makes them perfect for a little holiday indulgence. 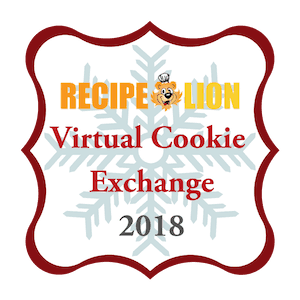 This recipe is part of the Recipe Lion Cookie Exchange this year! Nine other bloggers and I have created some stellar cookie recipes to help you get the holiday season started off right! Y’all be sure to check them all out! Preheat the oven to 350°F and line a cookie sheet with parchment or a nonstick silicone baking mat. In a large bowl, melt the butter and about 1/2 of the chocolate chips in the microwave using 30 second intervals. Stir after each interval. 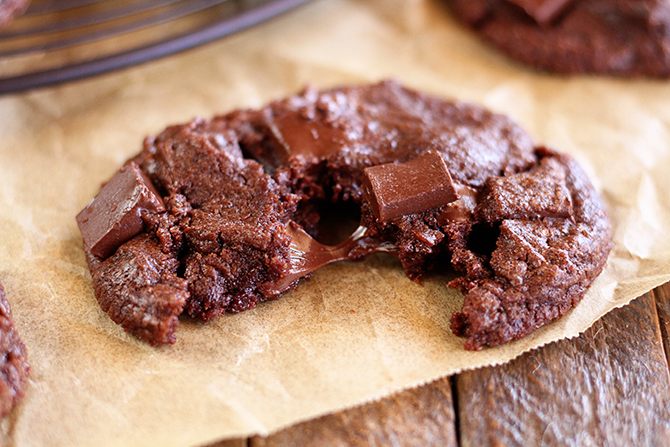 Melt until the chocolate chips are almost completely melted, then stir until they melt all the way. Add the sugar and stir well. Allow to cool for about 5 minutes. Add the vanilla, salt, and eggs and stir well. Add the cocoa powder and flour and stir very well to combine. Add the remaining chocolate chips and stir. Using a 1 1/2 tablespoons scoop, drop the dough onto the prepared baking sheet about 3 inches apart. Bake for 10 to 12 minutes. Allow to cool completely before removing from the pan. Dude! You’ve gone and done it now! They look so perfectly fudgy!!! 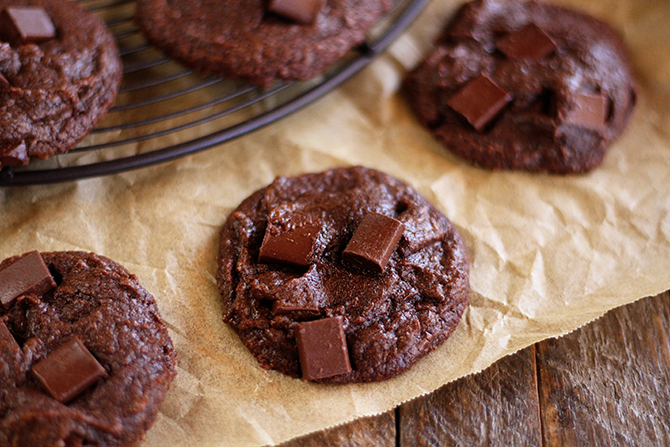 I have 4 chocolate lovers in this house who would adore these treats! Thanks so much! 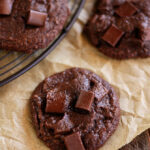 They are chocolatey for sure!! 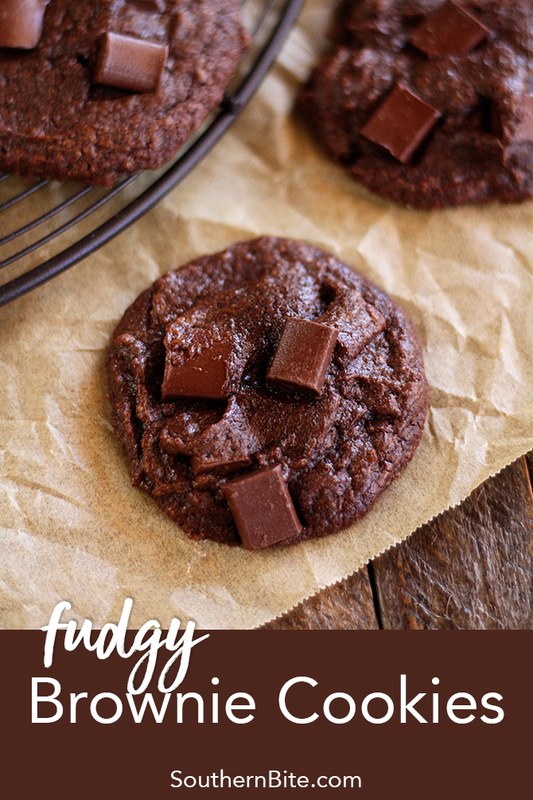 Well, I can’t resist anything that has fudge, brownie and cookie in the title! These look amazing! These sound and look delicious, can’t wait to try them! A question from the story about Christmas cookies… do you have your mother’s “recipe” for the cookie paint? Would love to do that with my nieces. Thanks, Jennifer! Let me see what I can find for you! You had me at fudge! These look delicious!!! I can’t wait to try this recipe! Another one I’ll have to make! I can already taste them!!! I’m so glad that these have turned out so well for you! !